The church of the Eremitani on a very sunny morning. 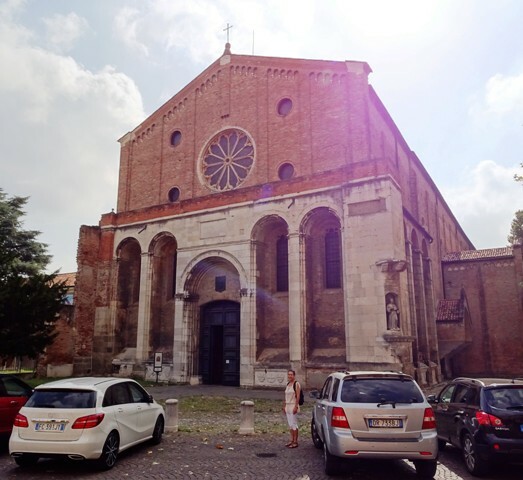 I can only describe the church of the Eremitani in Padova as a pleasant surprise. 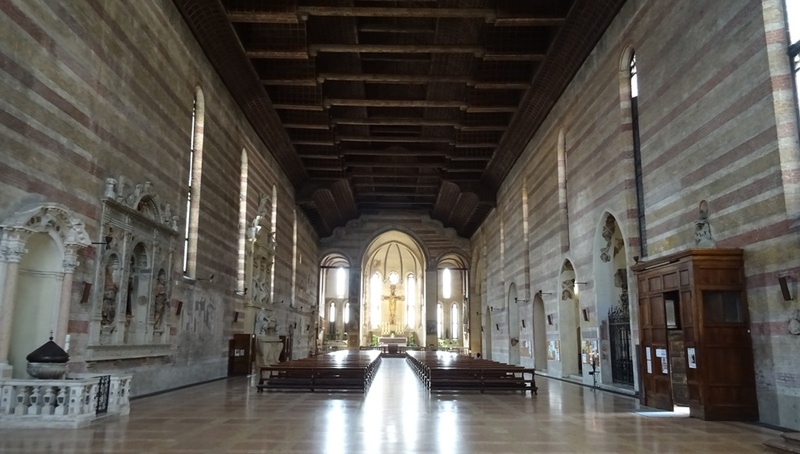 We still had about an hour to go before we could visit the famous Cappella degli Scrovegni, so we decided to pop in here and have a look. Our expectations were quite low, as the church had been described to us as “destroyed in World War II and subsequently rebuilt”. The description turned out to be accurate, but we found plenty of interesting art inside. The Eremitani is best known for having two splendid tombs of members of the Da Carrara family, as well as frescoes by Guariento and some very early work by Andrea Mantegna. The Eremitani or ‘hermits’ are members of the Order of Saint Augustine. It was this Order that built the current church on this spot between 1264 and 1276, replacing a previous building. The church is dedicated to Saints Philip and James. There is a tradition that Fra Giovanni degli Ermitani, who worked on the Palazzo della Ragione in Padova between 1306 and 1309, subsequently completed the ceiling of the Eremitani church using materials from the previous roof of the Palazzo. Perhaps this Fra Giovanni was also responsible for the pseudo-loggia that is part of the facade and partly continues along the south side of the church. Although most of the church’s history can be considered relatively uneventful, everything changed on 11 March 1944. On that day, the church of the Eremitani was severely damaged in an allied bombing raid. This was sadly no exception during World War II, as we have seen in Rome and Ravenna. The Eremitani had to be completely restored after the war had ended. Imposing interior of the church. 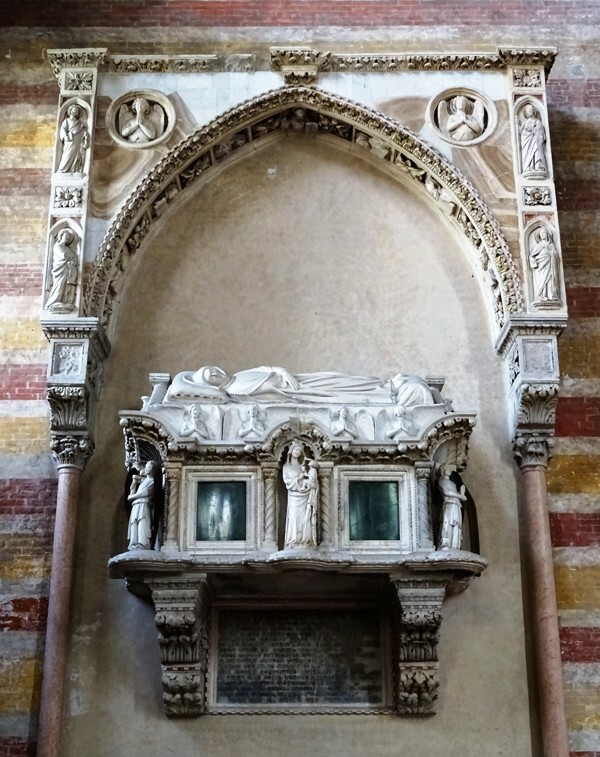 Tomb of Jacopo II da Carrara. The church has a single nave and therefore opens up to the visitor like a huge empty space (see the image above). Immediately to the right is the tomb of Ubertino da Carrara, Lord of Padova from 1338 until 1345. He was succeeded by his kinsman Jacopo II da Carrara, who ruled the city until his assassination in 1350. Jacopo has a matching tomb on the other side of the nave, directly opposite that of Ubertino. Both tombs are strikingly similar, and it should hardly come as a surprise that they were designed by the same artist, the fourteenth century sculptor and architect Andriolo de Santi. Jacopo’s tomb is slightly more interesting, as we can find a poem by Francesco Petrarca (1304-1374) on a marble slab beneath it. Jacopo’s son Francesco was a friend of the poet and granted him a plot of land in the picturesque village of Arquà to live out his days. Andriolo de Santi probably did not create the two tombs all by himself. He was likely aided by several assistants, and one of them has been tentatively identified as the sculptor Bonino da Campione. He is best known for his tomb of Bernabò Visconti, now in the Castello Sforzesco in Milan. The statues of the Madonna and Child and of the angels were originally painted in bright colours, and so were the effigies of Ubertino and Jacopo themselves. Strictly speaking, the Da Carrara tombs do not even belong here. They were originally in the church of Sant’Agostino elsewhere in Padova, but that church was demolished by the Austrians in 1819. They then built a military hospital on the spot, which was later converted into a military barracks. Fortunately, the two tombs were spared and transferred to the church of the Eremitani, where they can still be admired today. 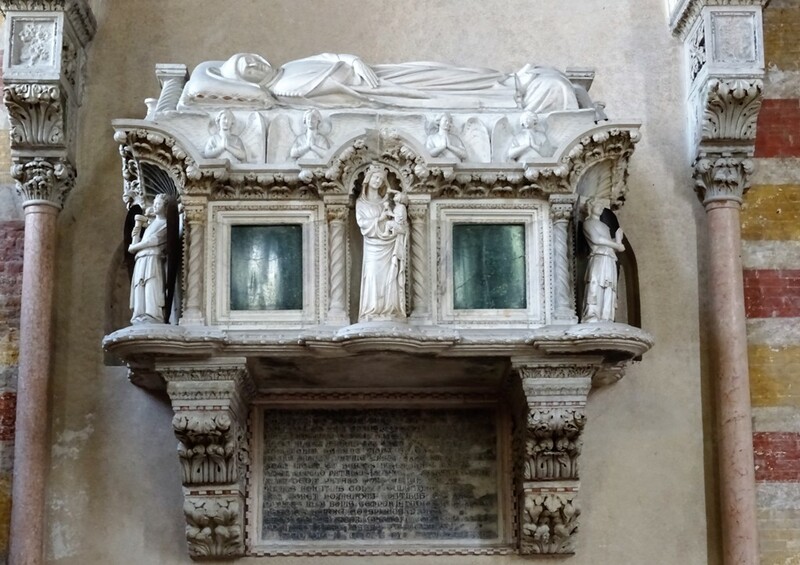 Close-up of the tomb of Jacopo II da Carrara. Guariento di Arpo (died 1369 or 1370) can perhaps be considered as the court painter of the Da Carrara family. Not only did he paint frescoes for the two Da Carrara tombs discussed above, he also provided the decoration for the private chapel of the Reggia Carrarese, the complex from which the Carraresi ruled over Padova. Guariento’s main work in the church of the Eremitani can be found in the Cappella Maggiore, i.e. the central apse behind the altar. Here he painted the Last Judgment and stories of the life of Saint Augustinus of Hippo, the bishop who developed the Rule of Saint Augustine (354-430) and can therefore be seen as the founder of the Order of Saint Augustine. Other frescoes told stories from the lives of the apostles Philip and James, the patron saints of the church. The frescoes can be dated to the early 1360s. Unfortunately, over half of Guariento’s cycle was destroyed in the 1944 bombing raid. Only the frescoes on the left wall have survived (see the image on the right), while those on the right wall and vault were blown to smithereens. What we see on the left wall is very interesting nonetheless. The frescoes in the lunette show Saint Philip being forced to sacrifice to Mars, the pagan god of war. The saint refuses, and replaces the pagan idol with a Christian crucifix. Moving on to the frescoes in the middle register, we see Saint Augustinus meeting with a group of African bishops on the left, while on the right Saint Philip is crucified by pagans. The final two frescoes, in the lower register, are both about the life of Saint Augustinus. The one on the left shows the saint experiencing a vision, while the one on the right depicts him as the Bishop of Hippo again. On the far right we see the baptism of a man who has been identified as Adeodatus, Augustinus’ son. Frescoes about the life of Saint Augustinus. Below the large scenes are smaller decorations presumably representing the planets. On the left we clearly see a personification of the Moon, while the flaming figure on the right is definitely the Sun. The large crucifix in the apse has been attributed to Niccolò Semitecolo, who was presumably Guariento’s principal assistant. The transport of Saint Christopher – Andrea Mantegna. Andrea Mantegna (ca. 1431-1506) was born in the small village of Isola di Carturo, near Padova. His birthplace is now known as Isola Mantegna, in honour of the artist. Mantegna became famous for works such as the San Luca altarpiece and The Dead Christ and Three Mourners, now in the Brera Museum in Milan. 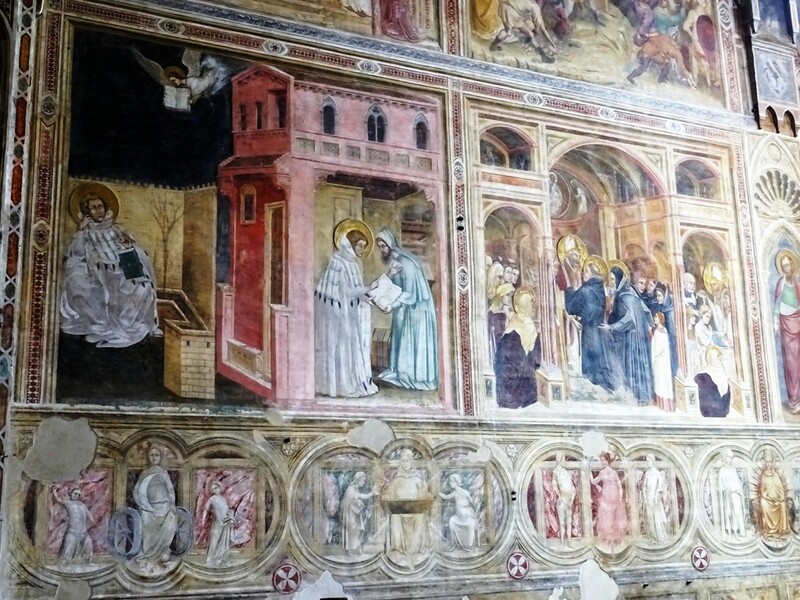 In the Ovetari chapel of the church of the Eremitani, we find some of his earliest work, painted between 1448 and 1457. Unfortunately, the bombs that hit the church in 1944 blew the frescoes to pieces. A thorough restoration completed in 2006 has done its utmost to repair the damage, and the result can be considered fairly satisfactory. 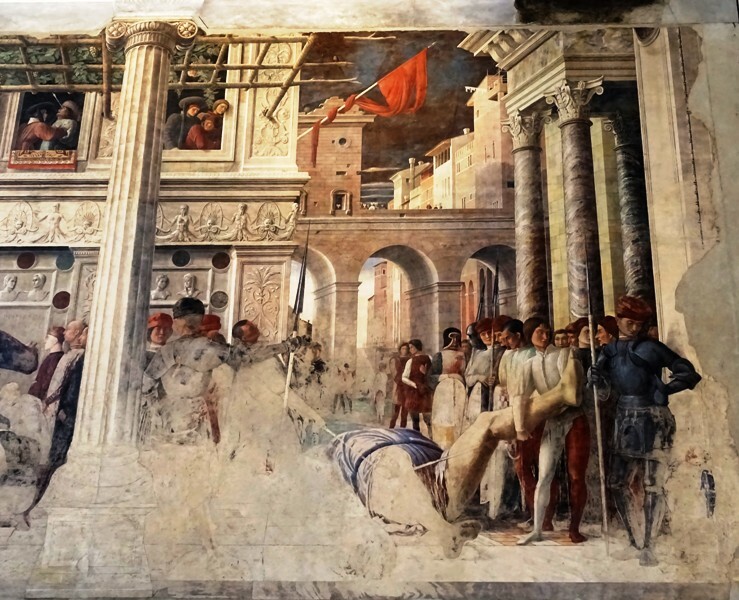 The restorers did their best, placing fragments of the frescoes back onto the walls wherever they could and filling in the – admittedly large – gaps with photographic reproductions in black and white. Mantegna was not the only artist to work on the decoration of the Cappella Ovetari. In fact, since he was still a teenager when the contracts for the frescoes were signed, other, more experienced artists initially took the lead. German painter Giovanni d’Alemagna and Venetian painter Antonio Vivarini frescoed the vault with images of the four evangelists, but the former died in 1450 and the latter then left the project a little later. Some work was done by Nicolò Pizzolo, who died in 1453. Mantegna himself did all the frescoes on the left wall, which has six scenes with stories from the life of Saint James. 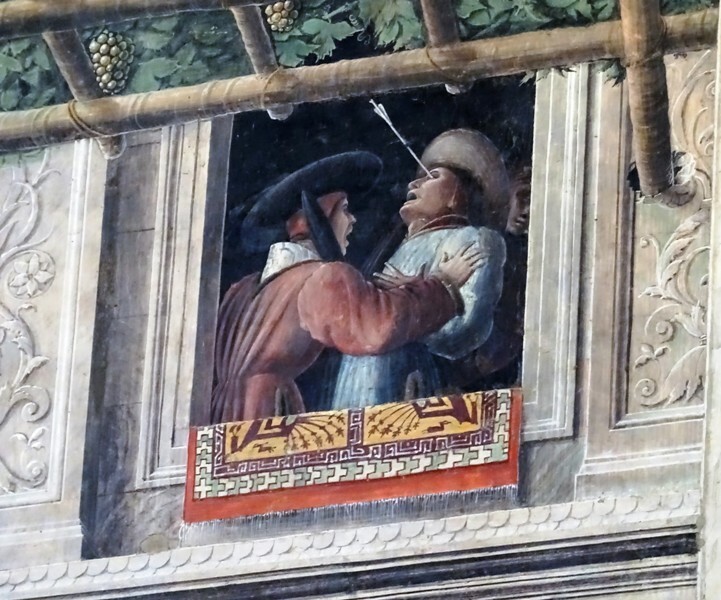 On the right wall, only the two scenes in the lower register are Mantegna’s work. They show the martyrdom of Saint Christopher and the transport of his dead body. The other scenes are presumably by Bono da Ferrara (one scene) and Ansuino da Forlì (three scenes). Evil pagan king hit in the eye. It is interesting to note that the scenes regarding the death and transport of Saint Christopher survived the war because they had already been detached from the wall in 1880. Although the two scenes are separated by a painted Greek column, they are in effect one united scene, which is clear from the architectural elements in the background, especially the palace with the frieze. On the far left, a gigantic Saint Christopher, badly damaged and barely visible, is tied to a stake. An archer tries to execute him, but the arrows simply bounce off his body. One arrow has even hit the evil pagan king in the eye who had ordered Christopher’s execution. This is one of the most dramatic and best-preserved parts of the frescoes. When attempts to execute the saint by ‘firing squad’ had failed, Christopher was decapitated. The right part of the scene shows Christopher’s now headless body – the head is no longer visible – being dragged through the streets. For the art discussed in this post, I have made extensive use of Davide Banzato, ‘Giotto en de 14de-eeuwse schilderkunst in Padua’ and Franca Pellegrini, ‘De beeldhouwkunst in Padua in de 14de eeuw’. Information about the church came from this website and from my Trotter travel guide. 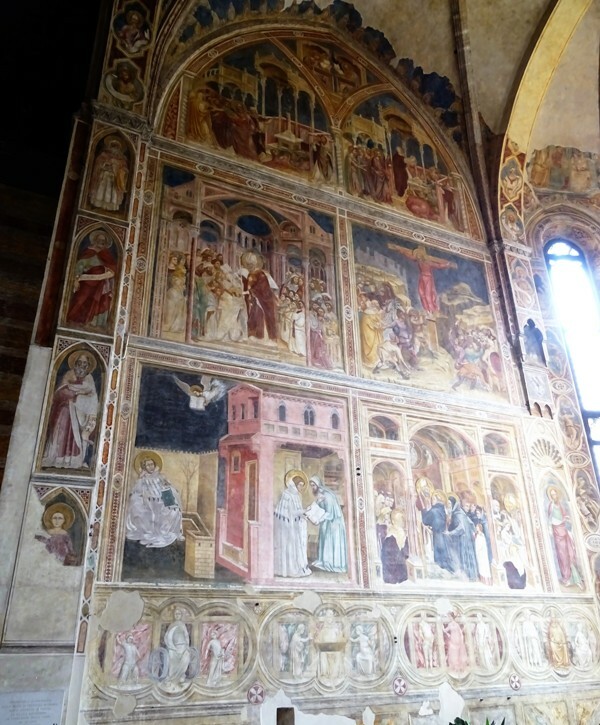 Compare the frescoes about the life of Saint Philip to those in the Cappella Filippo Strozzi in the Santa Maria Novella in Florence.